We are excited to host our third annual architectural sketching session and tour of Tai Kwun on December 10th (Monday) with students from the Savannah College of Art and Design. We will also be spending our time with local students from the Rotary Club of Hong Kong Island West Hong Shi Morninghope School. The Morninghope School teaches secondary school students who have intellectual disabilities. 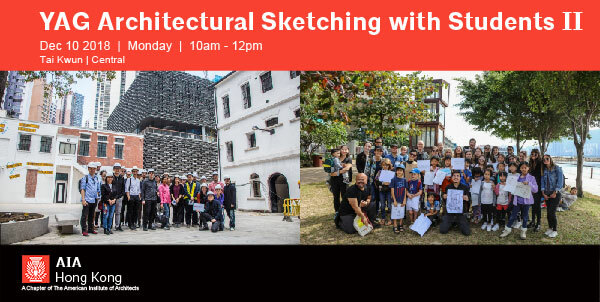 It will be a fun morning of sketching and working with the next generation of potential architects, designers, and artists, while sharing with them the importance of architecture and the architectural heritage of Hong Kong. The event is FREE, so please join us with your drawing pads and tools and connect with Hong Kong’s past and future! 10:00am-11:30am: Sketching and tour of the Herzog De Meuron Building. Architecture for Children (AFC) is a program developed by a group of volunteers in Hong Kong and New York who come multiple backgrounds but all believe creative thinking can help educate our future leaders. AFC received a 2017 AIA Hong Kong Community Citation Award and was founded by Vicky Chan, AIA.